Why U.S. officials taking tea with local Afghan elders seem to be wasting their time. Shamalzai District, Zabul Province, Afghanistan—The village of Sher Khan Khel sits at 7,221 feet, a few miles from where Zabul Province borders Pakistan. Stone and mudbrick houses dot the barren slopes (there is little that will grow at this altitude). Women wear dresses trimmed with coins and ink tribal tattoos on their faces, while the men are clad in traditional shalwar kameez and turbans. There is no electricity, no cell phone reception, no TV service. When I visited this spring, I asked a few men how far a nearby village was from another. "Two to three hours walking," was the answer. Distances here are often measured by walking. On the morning of April 21, a group of U.S. Chinook helicopters broke the village's calm. They landed near Sher Khan Khel, bringing dozens of U.S. and Afghan officials for a shura, or meeting, with village elders. Among the visitors were U.S. Lieutenant Colonel David Oclander, Zabul's maneuver commander; Ashraf Naseri, Zabul's governor; and General Jamaladeen Sayeed, the provincial army chief. Dozens more U.S. and Afghan police officers, soldiers, and doctors lugged medical supplies, prayer rugs, and a catered Afghan lunch. Their goal? To connect Sher Khan Khel's residents with the Afghan government, in hopes of building peace and order. In Sher Khan Khel, the Afghan government is a largely conceptual notion. The village is a two-day road trip from Kabul, and, while it is only 70 miles from Qalat, Zabul's capital, but the terrain is so rugged that only donkeys or motorcycles can handle the painful eight to ten hours the trip takes. There are no schools or clinics here, and there is no way to call the Shamalzai District authorities, who are hours away and embarrassingly inept. Recently, Shamalzai District's governor, called Wazir, was removed for corruption, as was the entire police force—twice in 90 days. There are thousands of Sher Khan Khels in Afghanistan—remote, traditional villages with little connection to the country's authorities, where militant groups find shelter, plot attacks, and funnel their arms, fighters, and drugs. These villages are the center of gravity for U.S. counterinsurgency strategy, which focuses heavily on shuras (and has since at least early 2007, just after the publication of the counterinsurgency field manual, FM 3-24). Every lieutenant and captain knows the drill: Sit down with village or town elders, drink tea, listen to their complaints, and enlist their cooperation in the fight against the insurgency, in return for government services, U.S. aid, or protection from the Taliban or a rival tribe. But, in Zabul, as in other southern provinces, the U.S. counterinsurgency (COIN) effort appears to be faltering. A recent Pentagon report revealed that, out of 121 districts critical to stabilizing Afghanistan, only 29 are sympathetic to the Afghan government. Forty-four are neutral and another 48 are sympathetic to the insurgency, including three of Zabul's eleven districts (Shamulzai and the province’s other districts were listed as "not assessed"). Indeed, many people here have ties—sometimes blood—to Taliban fighters. With the administration of President Hamid Karzai (who is in Washington this week for talks about U.S.-Afghan relations) widely viewed as a kleptocracy, there is little reason for Zabulis to risk defying the Taliban to stand with the far-off government. The immediate aim of the Sher Khan Khel shura, organized by U.S. commanders in Zabul, was to persuade the villagers to stop giving sanctuary to insurgents coming from Pakistan, helping them on their way to Kandahar and Helmand provinces. 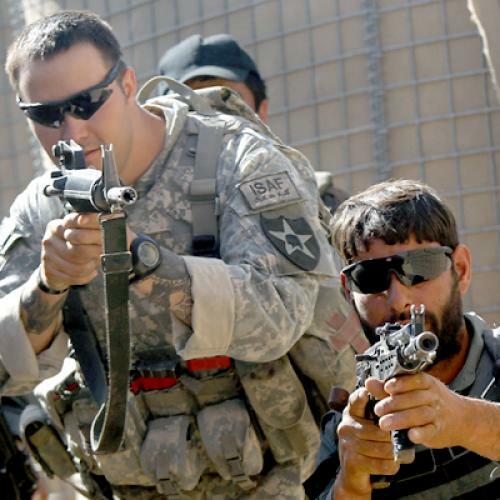 The U.S. and Afghan officials also hoped to enlist men in the village to join the Afghan National Police to help in the effort against the Taliban. The longer range and more elusive goal of the meeting was to put the village on the Afghan government's radar, and vice versa: Invite authorities to the village, and show residents that the administration wants to help them have a better life. The visitors climbed terraced, stony slopes to a large clearing surrounded by trees, shivering in the mountain chill. Blankets and rugs had been laid down on the ground, and, standing in a single-file line on one side of the clearing, village elders waited for the new arrivals to take their seats. Gaunt from a lifetime of subsistence farming, the elders looked to be in their seventies or eighties, though they were probably decades younger. One elder, the stoutest by far, sat on a raised cushion in front of the others. He was the village headman, Haji Abdul Salam, large, florid and about 50 years old. He opened the shura by explaining that most of the men in the village are economic migrants who go into Pakistan. There isn’t enough water in Sher Khan Khel to do much farming, so they have to go elsewhere to make money. The small number of men who remain the village, Salam said, cannot defend it from the Taliban—so they do not try. Naseri asked the villagers who among their sons would join the provincial police to protect the village. “This is our country. Everyone has an equal responsibility to protect it,” he said. At the time, there were no Sher Khan Khel men in the district police. The pay (roughly $250 a month is good, but the turnover rate is high. “Every month 100 men are coming and 100 men are going," the recruitment officer at Zabul’s provincial police headquarters told me. None of the elders spoke, or showed any sign of a reaction. Naseri continued, arguing that the region needs security so it can have schools. Then he added, perhaps with an eye toward the elders who likely have family ties to the insurgency, that any Taliban fighter is welcome to put away his weapons and reconcile with the government. At this point, three or four younger men, who had joined the outer edge of the elders’ line, smirked and talked among themselves. One turned his back on Naseri—an insult—and, one by one, they drifted away. The elders listened impassively. Only one villager besides Salam spoke. When noon came, lunch was served, but the villagers stayed on their side of the clearing, the visitors on theirs. And then, slowly, with little goodwill or fanfare, the gathering broke up. No agreements had been made, no aid promised, no allegiances pledged. As the American and Afghan officials made their way back to the helicopter landing zone, it was hard not to wonder when the Taliban would arrive in Sher Khan Khel again. Perhaps it would be that night. They'd make offers (or threats), and maybe, or even likely, elicit a more supportive response. Eight days after the shura at Sher Khan Khel, one of the young American officers in attendance, Lieutenant Sal Corma, a recent West Point graduate, was killed by an IED on a foot patrol in the Shajoy district of Zabul. “[He'd] give you the shirt off his back," Oclander told me. "Brought a light to any room he was in." Despite numerous shuras held in recent months, soldiers like Corma keep dying. (There had even been a shura in Shajoy earlier in April, where Oclander announced an initiative to pay locals to guard their own bazaar and roads, plus a $1,200 bonus if they serve a full twelve months.) The United States is offering all the carrots it can, but, in places like Sher Khan Khel, too many locals seem comfortable with the familiar—that is, the Taliban. Rather than disrupt the balance of things, they listen skeptically (if at all) to what the American and Afghan authorities have to say, then continue to support the insurgency, whether passively or actively. U.S. officials would like to say that the local shura strategy is working, that Corma and other young Americans have not died in vain—but, as the Afghans like to say, "it is not clear." Ann Marlowe is a visiting fellow at the Hudson Institute in Washington, D.C. and blogs for World Affairs. She just completed her sixth embed with American troops in Afghanistan and her fourteenth trip there.